Columbia Police Chief Skip Holbrook announces that CPD is a designated ‘drop-off’ site for the National Prescription Take Back Day which is set for Sunday, October 22, 2018 from 10:00 a.m. until 2:00 p.m. The CPD is partnering with the Drug Enforcement Administration (DEA) in an effort to provide a safe venue for persons to properly dispose of unwanted and unused prescription medicines. 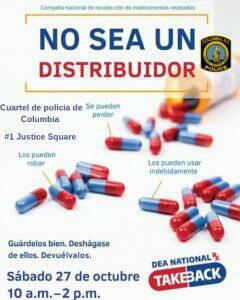 CPD and the DEA cannot accept liquids or needles – Only pills or patches. 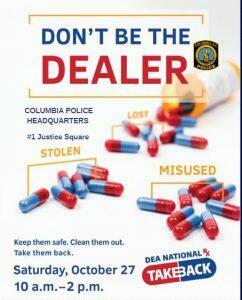 You can drop off your medications at Columbia Police Headquarters at #1 Justice Square (803) 545-3500. Studies show that medicines that languish in home cabinets are highly susceptible to diversion, misuse and abuse. A majority of abused prescription drugs are obtained by family and friends, including from home medicine cabinets. For more information on the National Prescription Drug Take Back Day, visit www.dea.gov or call toll-free 1-800-882-9539.